This home is the epitome of magnificent gorgeousness! 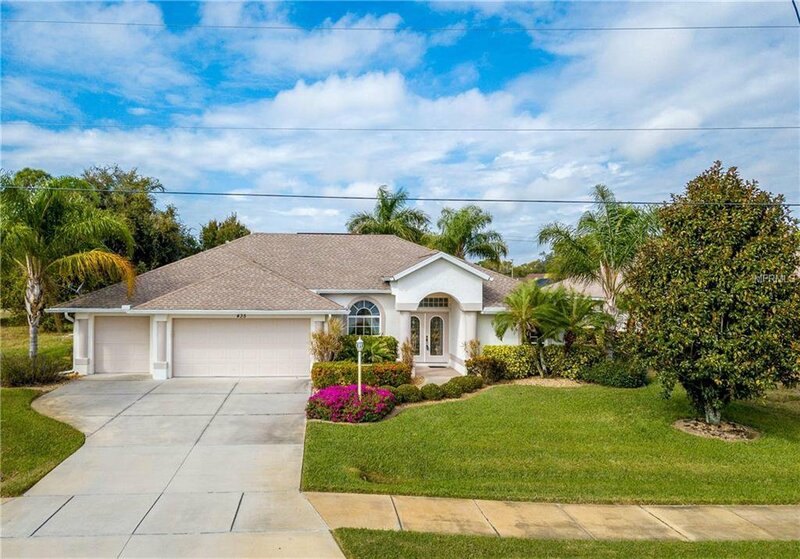 Perfectly situated on an oversized lot, the vibrant tropical landscaping leads you to the elegant columned entranceway where your leaded paned glass double front doors open to a decorator’s dream. The walls are tastefully painted or wallpapered, the lighting fixtures & ceiling fans are upgraded, and the designer window treatments attractively frame your windows. The high, vaulted, and tray ceilings create even more volume in this spacious home, and the numerous windows create an energizing flow of natural light. The split floor plan gives you privacy, and the large kitchen with breakfast bar and stainless appliances is perfect for entertaining. Sliding glass doors in the Living Room, Family Room and Master Bedroom, all open to the screened lanai, sparkling heated pool, breathtaking custom mural, and beautifully landscaped park-like private backyard. Wake in your spacious Master Bedroom with peaceful views and pamper yourself in the large master bath, straight out of HGTV. Spend a quiet morning on the lanai planning your day. Should you golf at one of the five premier community courses or spend the day at a local beach? Or just relax by the pool to the soothing sound of the waterfall, keeping your floors dry using the pool bath. The 2015 A/C system, Hurricane Shutters and X Flood Zone provide peace of mind! Park your toys in the 3 car garage, take advantage of the optional upscale furnishings package, and just park your flip flops, and relax! Listing courtesy of RE/MAX ALLIANCE GROUP. Selling Office: PROGRAM REALTY, LLC.